Our Personalised Christening Decoration would make a lovely addition to your Christmas Tree. Our Personalised Christening Decoration is the perfect little keepsake to celebrate this special day. Your Personalised Christening Decoration will be made from acrylic and personalised with the name and date of your choice. The perfect little stocking filler. Simply enter the name and date that you would like to have on your decoration and we will do the rest. Please note that our Personalised Christening Decoration is for decoration only and is not a toy. Each Personalised Christening Decoration will be individually made just for you. A lovely little personalised gift for family and friends. 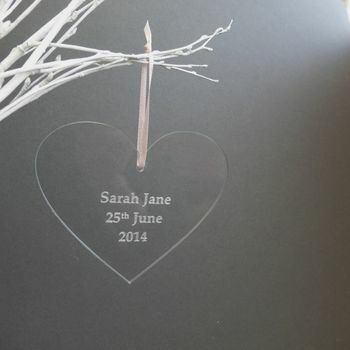 Each Personalised Christening Decoration will be individually made from acrylic and will be personalised just for you. This product is dispatched to you by EdgeInspired.